Unlike in most jobs, the basic function of a catcher is inherent in the job title. If you tell someone at a cocktail party that you are a Regional Director of Electronics and Advanced Systems Engineering, there is a good chance they won’t know what you do on a day-to-day basis; if you tell them you’re a catcher, even those with no interest in baseball should be able to get that one of the fundamental responsibilities of your job includes catching. While being a backstop involves a variety of responsibilities, catching baseballs is the primary one. No matter how good one is at controlling the running game, handling a pitching staff, and directing the infield, it is impossible to earn a living as a catcher without being able to catch. Everything starts with securing the baseball, or at least keeping it in front of you. In recent years, the baseball world has become more aware that it’s not only that you catch that matters, it’s also how you catch. Framing numbers have revealed that skilled receivers have earned their teams a significant amount of runs in the form of extra strikes. Style matters and presenting the ball a certain way has clear advantages. 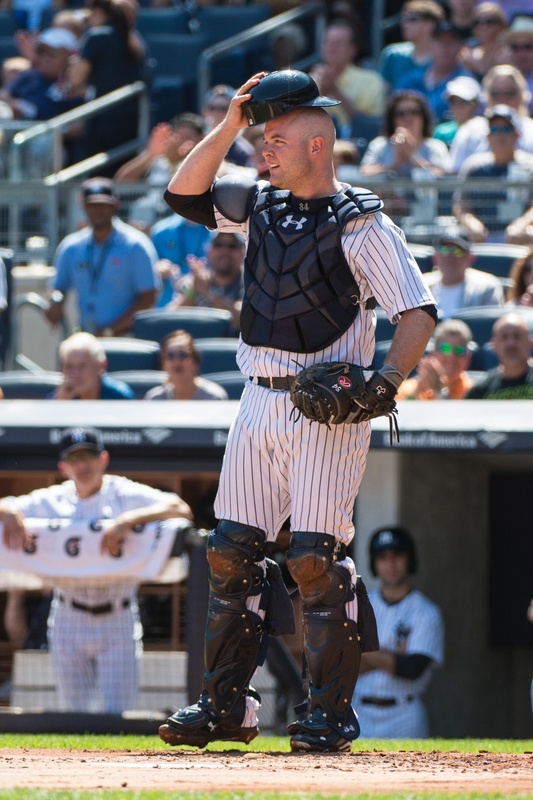 The New York Yankees have a catcher in Brian McCann who has an excellent reputation in terms of most facets of his defensive job, but particularly blocking and framing. McCann has been considered a good catcher for many years because he doesn’t let the ball get behind him and he frames it well. During the 2015 season, for the first time ever he did neither of these things. On the blocking side he allowed 55 wild pitches, the worst total in the majors. In his previous 10 seasons in the big leagues he had never allowed more than 44. It’s worth noting he had only one passed ball scored against him, but the difference is so subjective that the two can easily be crammed into one category and the 56 PB+WP he allowed was still a career high. In terms of framing—by both Baseball Prospectus and StatCorner measures—McCann took a free fall from 2014. Over the course of his career, the Yankees backstop has been one of the league’s top receivers so it is very peculiar to see him suddenly turn up as a negative in 2015. This information can be interpreted in a number of ways. It’s not entirely illogical to dismiss it as a bad year in a couple of areas, but nothing more. McCann has a long track record of excellence in these categories and that should mean more than a single season when projecting his performance going forward. If his bat had suddenly collapsed in 2015 it would be too early to label him an offensive liability. Things get a little bit more interesting when the fact that McCann’s on the verge of turning 32 is taken into consideration. While folk wisdom tells us that catchers age especially poor, the actual data seems to contradict that notion. However, spending a decade behind the plate is physically demanding. It’s not difficult to imagine it sapping some of the abilities needed to block baseballs for instance. Both agility and reaction time undoubtedly erode with age. Framing is a little bit of a different story. The numbers are too new for us to know how well the skill of framing ages with any kind of confidence. It is apparent that one can be an excellent receiver at an advanced age, a la Jose Molina, but he might just be one-of-a kind. When it comes to 2016, McCann’s ability as a blocker should be scrutinized closely because of his age and last year’s results. Expecting him to lead the lead the league in wild pitches allowed once more might be a bit of a stretch, but he’s already posted one worrying season in this domain and his skills could be slipping away. More optimism should be sunk into a framing bounce-back. It seems unlikely his strike-stealing wizardry would dissipate for no apparent reason. Framing is not linked closely to a specific hard physical skill, so it’s more difficult to imagine Father Time factoring in so abruptly. It’s very possible that 2015 will likely go down as a blip. Going into next season, McCann is a rock-solid two-to-three win catcher who should be the last on a Yankees’ fan’s list of worries. It wouldn’t hurt him to catch the ball a little better though. After all, it’s right in his job title.